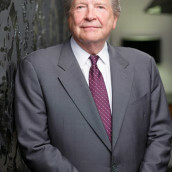 Richard E. Aleksy is recognized as a preeminent trial attorney. He has briefed and argued many cases before the Illinois Workers’ Compensation Commission, various Circuit Courts, and the Appellate and Supreme Court of Illinois. He has earned an enviable reputation within the legal and insurance communities for his work involving workers’ compensation, disability determination and related aspects of injury law. In 2016, Richard’s peers selected him as one of the top ten workers’ compensation lawyers in the state of Illinois, per Leading Lawyers. In 2014, Richard was selected as Chicago’s Lawyer of the Year in The Best Lawyers in America in the area of workers’ compensation law. He has also been recognized in the Cambridge Who’s Who, is a member of The Leading Lawyers Network, and has been consistently selected as a member of the Super Lawyers group since its inception. In 2011, Richard was one of only twelve people selected by Governor Pat Quinn to serve on the Illinois Workers’ Compensation Advisory Board. He has also been a member of the board of directors and president of the Workers’ Compensation Lawyers Association.